Village Market in Portland Oregon ... a great idea already in action! Please open the link to the Village Market project in Portland Oregon USA (in the title link) sponsored in part by Janus Youth Programs to simultaneously support local farming AND disadvantaged youth. The store is non-profit and offers jobs creation in a healthy environment, a commercial sector now enjoying greater popular demand everyday. Like what you see? You can donate to the worthy cause at: https://giveguide.org/#villagegardens and learn more from Village Markets and Janus Youth Programs how to start making healthy change in your community Now. To learn more, see what non-profit marketing looks like and to get involved, please check out the Village Gardens website! This week's Village Market Rewards game Quiz questions: Answer correctly by emailing us your answer with the subject "Community Servicing Community"
1. For what neighborhood in Portland was the Village Market project created? 2. Name another service organisation involved with the Village Market. 3. True or false- the Village Market is non-profit. 4. Name 2-3 products available at the Village Market. 5. What will reward do I receive for volunteering just 3 hours a week at the store? First awards will be given this Wednesday in time for Thanksgiving dinner shopping. Your reward voucher is called celestial melodies in honour of a very special soul who is reconstructing her life from homelessness. Last Leucadia Farmers(Encinitas) Market of 2011….. and we have lots of adult children showing up for the holidays! So the bounty is even bigger this week. There is a bag of an heirloom beans in front of the baby broccoli crowns; walnuts and almonds; two dozen vegetable fed fresh eggs; gorgeous dino kale! 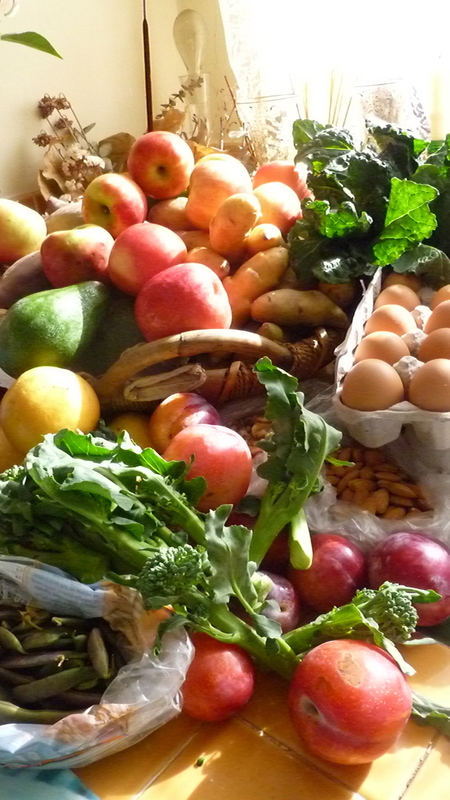 pluots, plums, asian pears, and pink lady apples; fingerlings and yukons; fuertes; osaki sweet potato and yam…. wow! The menu plan is unfolding for the week of feasts. May you and yours discover bounty in togetherness and Love this winter and all seasons! Blessings. Click on the link below to get to our fussbook page and “like” us, please! Your Local Farmers Market … Are you there? Today I began my Farmers Market shopping, as I do most Sundays, with the egg man. There’s only one egg seller at our Leucadia market and he is so reliable that he only misses two Sundays a year. An honest farmer who grows many vegetables that my family enjoys each week; he feeds his chickens from his gardens, harvests the eggs Friday eve before Sunday market, and answers everyone’s questions about gardening, chickens, and the weather. I was pleased to see yellow Yukon potatoes back today. His wife explained to me that the curious weather has all their crops out of order so they keep planting and they harvest whatever’s growing this week. This stand often offers potato fingerlings and purple potatoes and many other potato varieties. I encourage her to keep trying because we love all of them. Next, I cross the aisle to my sweet potato man. He’s such a sweet soul himself; always knocking off the extra cents on the total and helping everyone find what they’re looking for. He seems quite proud of his purple sweet potatoes, I feel I should buy more of them, but in keeping with conservation, I only buy what I know my family will eat. Today I also looked forward to the winter squash lady. She grew up on a Kansas farm and she knows her vegetables. Enthusiastically she describes what’s growing back on the farm, and what she’s about to be out of, to be replaced on the stand with something else special next week. She’s unusual because she sells organic nuts and exotic fruits in addition to all her beautiful winter squash. The price on the walnuts is so good, I try to splurge by filling a bag with them, but I still pay less than $5 and we will enjoy these all week, if I don’t decide to bake some cookies with them! There’s a dear family that I always buy beans from; today she has huge flat beans. I drop the overflowing basket, enough for two to three meals, into one of my recycled plastic bags and happily pay the husband $4 small dollars…I hope these prices keep them farming. We are on the lookout for avocados and do not have to look very far to find another little family’s booth selling healthy organic avos for a worthwhile price. I choose three medium sized avos of different ripening levels and appreciatively hand over a five dollar bill. Sending my spouse to Kristie’s booth for greens, I relax in Suzy’s Organic stand to the music of the women growers’ voices describing the weekly harvest box and fielding recipe questions from the customers. I cannot locate the fresh stevia but one of the wholesome gals smilingly shows me that stevia is front and center of the pepper and herb table. I choose some fresh mint too, to go with the stevia for an infusion “cool drink” this hot autumn week. I see Suzy has gorgeous cucumbers this week too and grab one to slice up for our eye treatments. Suzy’s broccoli is knock ‘em dead voluptuous this Sunday…four large full crowns will go into the Thursday casserole…mmmMm! And a pepper is suggested to fill in the last ten cents to make the total of all these choice items an even ten dollars. This description barely scratches the surface of all the healthy goodies out each week. I purchase what I know will feed my family for seven days and look forward to returning every Sunday for more fresh, as fresh as you can get without growing it yourself, nutrition. I call this the fun way to grocery shop. There’s organic or free range meats, breads, cheeses, oils, teas, coffee beans or ground; there’s multi national meals and fresh-made refrigerated spreads to take home; pastries; homemade pastas; pet food; seasonings and other herbals; flowers, garden starts, and worm castings; local made crafts including clothing, purses, kitchen tools. The list goes on and it’s all at the weekly Farmers Market. Are you with me yet? Let’s keep our community thriving and our families healthy. Your participation is vital and we’d all enjoy your input. So please come on down! I will meet you at the coffee cart, if you like….or would you rather a gluten-free sugarless pastry that melts in your mouth? Too healthy? There’s 5 or 6 other pastry stands any week to choose from. Think of this as a party and you are our beloved guest. An advocate for patients might save your life in the hospital. Could alternative medicine practitioners take the lead in health policy? Lets hope so! for everyone’s benefit. Under The Influence – 60 Minutes – CBS News. New York Review provided this excellent review of several books revealing the atrocity of greed behind the promotion of many pharmaceutical products. I have copied the review here for your perusal. Read it with an open mind. But according to Senator Grassley, who compared Emory’s records with those from the company, Nemeroff failed to disclose approximately $500,000 he received from GlaxoSmithKline for giving dozens of talks promoting the company’s drugs. In June 2004, a year into the grant, Emory conducted its own investigation of Nemeroff’s activities, and found multiple violations of its policies. Nemeroff responded by assuring Emory in a memorandum, “In view of the NIMH/Emory/GSK grant, I shall limit my consulting toGSK to under $10,000/year and I have informed GSK of this policy.” Yet that same year, he received $171,031 from the company, while he reported to Emory just $9,999—a dollar shy of the $10,000 threshold for reporting to the National Institutes of Health. No one knows the total amount provided by drug companies to physicians, but I estimate from the annual reports of the top nine USdrug companies that it comes to tens of billions of dollars a year. By such means, the pharmaceutical industry has gained enormous control over how doctors evaluate and use its own products. Its extensive ties to physicians, particularly senior faculty at prestigious medical schools, affect the results of research, the way medicine is practiced, and even the definition of what constitutes a disease. Some of the biggest blockbusters are psychoactive drugs. The theory that psychiatric conditions stem from a biochemical imbalance is used as a justification for their widespread use, even though the theory has yet to be proved. Children are particularly vulnerable targets. What parents dare say “No” when a physician says their difficult child is sick and recommends drug treatment? We are now in the midst of an apparent epidemic of bipolar disease in children (which seems to be replacing attention-deficit hyperactivity disorder as the most publicized condition in childhood), with a forty-fold increase in the diagnosis between 1994 and 2003.18 These children are often treated with multiple drugs off-label, many of which, whatever their other properties, are sedating, and nearly all of which have potentially serious side effects. The problems I’ve discussed are not limited to psychiatry, although they reach their most florid form there. Similar conflicts of interest and biases exist in virtually every field of medicine, particularly those that rely heavily on drugs or devices. It is simply no longer possible to believe much of the clinical research that is published, or to rely on the judgment of trusted physicians or authoritative medical guidelines. I take no pleasure in this conclusion, which I reached slowly and reluctantly over my two decades as an editor ofTheNew England Journal of Medicine. Copyright © 1963-2011 NYREV, Inc. All rights reserved.